Looking out at the unseasonably heavy snowfalls on the first Sunday of the river close season has made me almost grateful that I am prevented from going fishing on the Thames this weekend. However, last month’s polling by the Angling Times and a series of vigorous, but respectful, debates at six recent Angling Trust regional forums have demonstrated beyond doubt that the river close season remains a live issue amongst anglers. A brace of prime roach from the Thames at Reading caught by my friend Alan Clarke on the last day of the season. 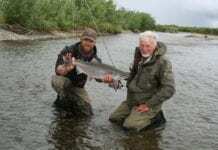 Inevitably there was talk about the future of the river close season as we packed our rods away. In order to try and resolve this perennial question the Angling Trust pressed the Environment Agency to conduct a full review of the existing arrangements in order to put some long overdue science on the table to enable a sensible decision to be made about when and if we should be stopped by law from going river fishing. In 2015 the Agency set up a consultative panel to guide this work, which included a review of arrangements in other countries and examination of available scientific studies. The panel was chaired by Steve Axford from the Institute of Fisheries Management and contains fishery scientists and three representatives from the Angling Trust all coming from very different positions on the matter. The evidence paper, which has been approved unanimously by the whole panel will be published shortly and will be the subject of an EA consultation this Spring. Although this is not the first time the coarse fishing close season has been subject to review, it is the first time that there has been a genuine attempt to seriously engage with anglers and listen to our views. As part of that process we thought it would be useful to hear from three highly respected and knowledgeable river anglers who all have a different take on the river close season. Top UK match angler and former Team England member, Darren Cox is a strong advocate for removing the river close season altogether. Angling writer and river enthusiast Bob Roberts argues the case for reforming the current arrangements while Angling Times columnist and broadcaster Keith Arthur believes strongly that he has yet to see any reason to change the existing closure period. Darren Cox believes that there is no longer any need to close the rivers to fishing. As a 52-year-old who has fished since the age of seven, I find it incredible that the existing laws on the closure of rivers throughout England and Wales (not Scotland or Northern Ireland, which are still open to coarse fishing year through) still exists despite absolutely no reason other than it is what was decided back in 1878. Since that date fishing habits have changed dramatically. Approximately 80% of all coarse fishing in the UK now takes place on man-made ‘commercially run’ lakes where the same species of fish swim around and can be fished for 365 days of the year. Due to the restrictions on rivers, attention has moved towards these commercial fisheries where the stocks are guarded 24/7 from predation and poaching. Fewer anglers frequent our beautiful rivers as they are not afforded the same protection, and by the nature of the banks being empty for three months, both predators and poachers alike run amok in some areas. These are the biggest threats to our natural stocks of river fish species. There is absolutely no scientific evidence that there should be a closed season, the law was created to protect fish back in 1878, as most fish were taken for the table. These times have changed and most managed fisheries, rivers and lakes alike insist all fish be returned to the water alive. I spent my younger years fishing almost exclusively on the River Wharfe and River Nidd in Yorkshire. For many years we were allowed to fish on rivers for trout in the ‘closed season’ with baits such as maggots and worms, which we loved to do. We also caught many coarse fish at the same time. However, there were some species, like dace, which vanished for several weeks. Nobody could ever catch any as they had obviously disappeared to spawn. I have also fished competitions on many rivers up and down the country (within the fishing season) and indeed all over the world, and had fish spawning in the weeds at my feet. There is no way you will ever catch a fish which is spawning! They are oblivious to anyone being around them as they have other things on their mind. Also, nobody told them that they were outside of the ‘spawning’ season either! Coarse fish spawn from early February to July depending on species and weather. That is half the year, so how can we claim that the current season protects fish stocks when they are spawning? Eventually there will be no more fishing on rivers if the current regulations are kept in place as local clubs cannot survive to even break even when they are restricted from allowing fishing on their waters for 25% of the year! Add that to a bad winter, which can mean losing up to another three months due to floods and cold weather then it is understandable that these organisations are ready to call it a day. These are the organisations that have local bailiffs to ensure that rules and regulations are adhered to by their membership. Poachers are prevented from illegally taking fish stocks and predators are regularly deterred from helping themselves. The organisations are also the eyes and ears of the riverbanks up and down the country. Years ago, as the Pollution Officer for Boston Spa Angling Club I was able to alert the water authority to various irregularities in water quality which may have been extremely detrimental to lots of aquatic life, let alone fish. For these reasons alone there is absolutely no justification to retain the old and antiquated law which applied to a different generation of anglers in what was a very different world for fishing. Catching this spawn bound chub on June 16th saw Bob Roberts pack away his river tackle until July 1st. Bob argues strongly that the close season dates are all wrong. I feel rather sad for those who fear change. Left to them we would still be living in caves, happy that the world is reassuringly flat. Of course, there would be no closed season for coarse fish because A, there would be no such thing as legislation, and B, well, folk need to eat, don’t they? And there’s the rub. Anglers had been catching fish for nigh-on 40,000 years before some bright spark decided to invent a closed season. If those 40,000 years were squeezed into a single day then man has only observed a closed season for about 4 minutes, so please don’t tell me we should keep the closed season because we’ve always had one. We haven’t. We are observing the current closed season according to an 1878 Act based on zero scientific evidence. Even the agreed dates were a compromise which made little difference in an era when everything caught was taken home and eaten. And by pure coincidence it kept the riff-raff away from rivers when salmon were running. Can anyone explain: what is the significance of it being 93 days long? No, thought not! Some say rules are made to be broken. I disagree. Rules exist for good reason but should be routinely challenged to ensure they continue to achieve their intention. If not, then they need amending or abolishing. Laws by their very nature must evolve with changing circumstances. Should it still be legal for a male to urinate in public, as long it is on the rear wheel of his motor vehicle and his right hand is on the vehicle? Of course not. Angling stands at a crossroads. We have an opportunity to drag our sport out of the 19th Century although I hope people will not make their choice lightly. Only three options lie before us: keep , abolish or amend. If you think nothing has changed since 1878, that anglers take home everything they catch, that water quality, fish stocks, fishing practises and the climate is exactly as it was in the 1800s then thee must taketh up thy quill and vote for retaining the status quo. There is clearly no point in changing anything. If you think it’s okay to target fish relentlessly, round the clock, 365 days a year and to hell with the consequences, then you should vote to abolish the closed season. On the other hand, if it’s the fish you truly care about then why on earth would you pretend there is anything ‘glorious’ about the 16th June? Those who think it’s perfectly fine to be targeting barbel and chub in shallow water on June 16th need to take a long hard look in the mirror. It’s never right, is it? We know the fish are invariably preparing to spawn, spawning or recovering on the 16th. You must vote to amend. The closed season is not set in stone and never has been since it was introduced. Change is something we’ve seen before on still and moving water. Here in Yorkshire the river season used to open on June 1st. The Broads used to open for Easter and Whitsuntide, if I’m not mistaken. Stillwaters were closed in Yorkshire but remained open all-year-round in the adjoining county of Lincolnshire. Did these exceptions damage angling? It is far easier to amend than to re-introduce a Law. If the close season goes then it is likely gone for good, whatever the consequences. But if we retain it, with suitable amendments, then it would be far easier to refine our choice later should it prove necessary to shorten, lengthen or change the dates and for that reason I would heartily support amending the current dates. Personally I can see no harm in fishing on through March until the end of April but would close all rivers through May and June. Were it up to me I would like to go a little further and make those who control the fishing on stretches of river responsible for ensuring they be closed during periods when fish show obvious signs of spawning beyond the closed season. And if it were made illegal to disturb spawning fish then that could be applied to ALL users of the water, not just anglers. Taking that even further I would place a responsibility on those who control fishing rights to keep records proving they have continually assessed conditions and closed the water when appropriate. This means a club might close a stretch immediately below a weir whereas further downstream the river remains open to fishing, thereby protecting the spawning grounds whilst allowing fishing to continue elsewhere. This would safely protect exceptional years. Sensible measures like this achieve everything the original Act was intended for, which is to protect spawning fish whenever this happens whilst incorporating elements of change and control. I can’t wait to fish on the ‘Glorious First’. How about you? Keith Arthur wants to see incontrovertible scientific evidence that fish would benefit from any change to the existing close season on rivers. Keith Arthur – Why Change? The first thing that is obvious about making any changes to the close season is that public opinion should be the last, the VERY last, consideration. We are not dealing with what anglers want here but with precious stocks of fish already threatened on many fronts, not least of which is predation. When you add to that abstraction, creating reduced flows and shallower water with less oxygen; coarse fish being targeted as a food source with seine nets, cast nets, long lines and groups of anglers fishing with multiple rods purely to remove adult fish; pollution, poor river management with habitat destruction removing valuable spawning grounds it’s almost a miracle we catch anything at all, never mind many rivers producing better catches than at any time I can recall in over sixty years of fishing. That alone should tell us we are doing something right and I believe one of those things is allowing fish three months peace and quiet from being pressured by anglers to do what they do. Some will say they have a good break thanks to poor river conditions in winter. So if a particular winter is bad for angling should we cancel just that close season? How about when we have a mild, dry winter and fishing is phenomenal – as it has been on some rivers this year – should the official break be reinstated? That’s nonsense really isn’t it. The concept of abolition is about one thing and one thing only in my opinion, and that is selfish anglers wanting to fish more with no consideration about the future…the future when I and possibly most of them will be long gone because any destruction won’t be noticed in a couple of years. The law was put in place NOT, as some have stated, to keep the poor off the banks so the gentry had rivers to themselves to fly fish for their preferred species. Those gentry fished their own private stretches anyway. The law was introduced to protect spawning fish. OK, I’ll concede that it was at a time when coarse fish were usually taken either for the table or trophies. However our population then was way less than half what it is now; pressure on water was less from every perspective. There have been challenges to the close season before and it seems to have been swept under the carpet that the last review was in the early 1990s when the close season was abolished on still-waters. The only reason the then authority, the National Rivers Authority, deemed that acceptable was because fish in almost every still-water belong to someone and, if there should be a catastrophe caused by interfering with spawning, those fish could be replaced. They are a commodity, in many cases an investment to produce income, just like stock on the shelves of a shop. They concluded the same applied to canals when that close season was abolished a couple of years later. Fish in rivers, and only in rivers, are a public resource belonging to us all, not just anglers! The NRA’s research, conducted by universities and scientists, concluded that in rivers particularly fish were not discrete; they moved, sometimes long distances to gather in massive aggregations to spawn. Most of us who only fish in Britain wouldn’t be aware of that because it happens when we are away from the banks…in the close season. I and many others have seen it first hand in Northern Ireland where unbelievably huge shoals of fish move to their historic spawning grounds and in doing so are targeted by mostly match anglers on festivals. The fishing on Lough Erne, where most of these festivals were held, declined to such a degree weights are now not as good overall as they are in many English festivals held during the season. Circumstantial evidence it may be but here’s just one example. The Sillees River which produced a bag of 266lb for Pete Burrell in 1981, an all roach catch, lost its spawning run within ten years, possibly because that whole strain of roach had died out. Fish certainly haven’t got the mental capacity to remember not to go somewhere! If we are to have change then it can only be done through science and research, something that will take fishing trials and last for many years. If, as some contend, we should make the close season fit spawning times it should be extended rather than reduced although I don’t think that’s necessary. In Yorkshire, coarse fishing tactics with bait restrictions were used through the close season to catch trout. Groundbait, keepnets, maggots and bread were banned to restrict potential damage to coarse fish stocks. Do you think those asking for abolition would find that acceptable? Of course not. This is a change begged for by match anglers – which is my angling background – to carry on as for the other nine months so those huge shoals, as in Ireland, will be hit, kept in nets and, shamefully, probably suffer like those Sillees roach. It’s madness spawned, excuse the pun, by selfishness and greed. Show me something that will benefit the fish and I’ll listen: I’ve been waiting a few years to hear one and it’s not happened yet. Whilst as anglers we all have our views, and mine have been set out here on several occasions, the Angling Trust as a whole is determined to remain ‘studiously neutral’ in this debate. We see our role to facilitate the proper engagement of anglers in decisions that affect our sport and the environment upon which it depends. It will be interesting to see if some of the hard and fast views on the river close season are changed in any way once the EA paper is published. Next articleDrop-shotting – a welcome diversion!